On 23rd January in Intercontinental Hotel in Warsaw the 6th edition of “Świat Kobiety” Magazine Super Product plebiscite took place. Jury consisting of Wanda Biernacka - editor-in-chief of "Świat Kobiety", professor Wojciech Drygas - cardiologist at the Cardiology Institute in Warsaw, Joanna Chatizow - cosmetologist, medical science doctor Anna Lewitt - nutritionist, Izabela Zaleska - Publishing Director of Women's Magazines by Bauer Publishing, Grazyna Wolszczak - actress and Katarzyna Zielińska - actress chose the SuperCosmetics. Scrubs and body balms with vanilla, lemon grass and coffee scents from Spa! 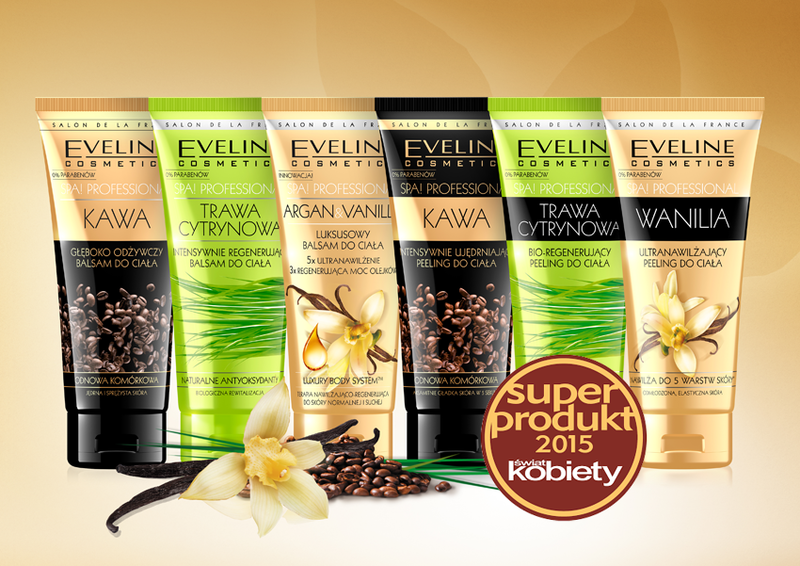 Professional series by Eveline are the cosmetics with unique composition of active ingredients that deeply moisturise and nourish the skin. Scrub particles gently massage, stimulate microcirculation and firm the body. Appetizingly scented grain formula gently removes rough epidermis, visibly improves skin look and leaves it silky soft to the touch. Stimulates natural processes of cellular renewal, supports cellulite reduction and eliminates skin dryness and roughness. Scrub perfectly prepares the body for care treatments.